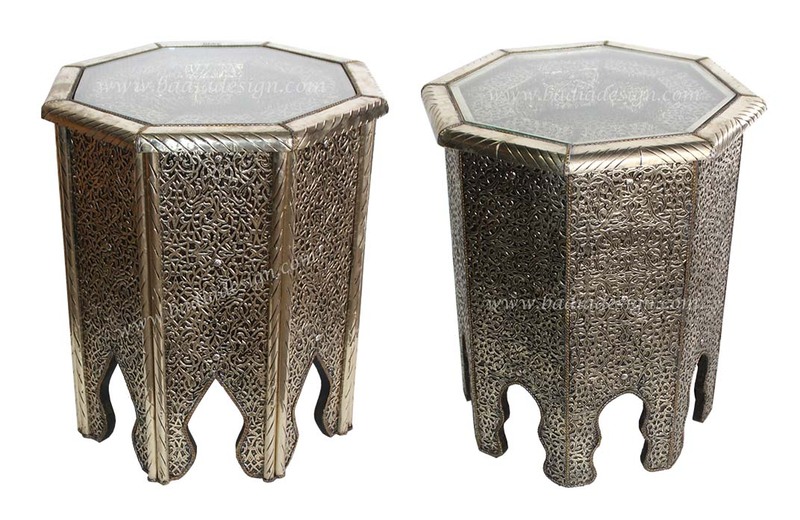 Moroccan Silver Nickel Side Table with Glass Top from Badia Design Inc. There are two designs listed above, please choose the one you want to purchase. Our Moroccan Side Table was hand carved from pressed metal by our skilled artisans in Morocco with a Mediterranean style look and feel. This is a beautiful and elegant piece of furniture that can be used as a side or end table and it comes with a glass top. It can also be placed in just about any room in your home or office as a decorative piece that will be admired by family members and friends for many years to come. Because our furniture is handmade, there may be some minor imperfections from piece to piece. This should not be considered as defective products. Click the button below to add the Silver Nickel Side Table - NK-ST003 to your wish list.